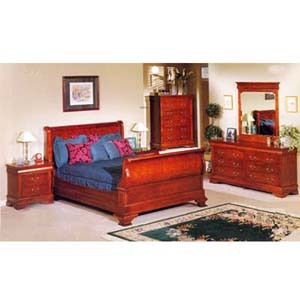 5-Piece Bedroom Set. Available In Queen And King Size. Includes Bed (Headboard, Footboard, Bed Rail). Night Stand Size, 26 3/5 x 16 1/2 x 27 3/4H. Mirror Size, 42 x 2 1/3 x 45H. Dresser Size, 71 1/2 x 18 1/2 x 34H. Chest Size, 42 1/2 x 18 1/2 x 52 1/2H. Strong Construction. Easy To Assemble. IEM7033_.